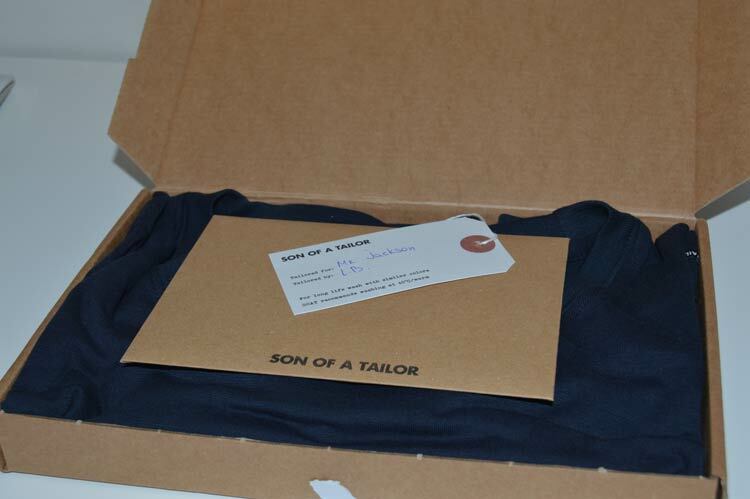 Sonofatailor.com is a new concept of ordering a tailored T-shirt online, which I will be reviewing today. 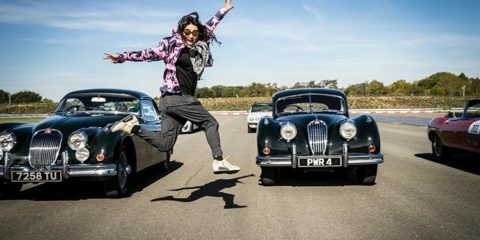 I was initially intrigued by the concept of tailored t-shirts and was excited to see what differences I would appreciate as a result of the tailoring. So I headed over to the website to start the process. The website was extremely simple and easy on the eye. Nothing about the process was difficult to grasp, the instructions were clear and the concept was engaging. Your first question you’re asked is “Old School or New School?”. By the appearance of the examples, it seemed that the Old School option had a higher neck so I opted for that, I’ve never been a fan of V-necks or low cut necks. I was then given the option to choose what type of neckline I desired and the color I wanted the shirt. I opted for the Crew neck in Dark Blue. At this point, I was totally happy with the website and the detail that was already being required at this early stage. I also though it was a nice tough that they noted the thread count of the shirt because it gave me a little hint as to what kind of quality I should expect. 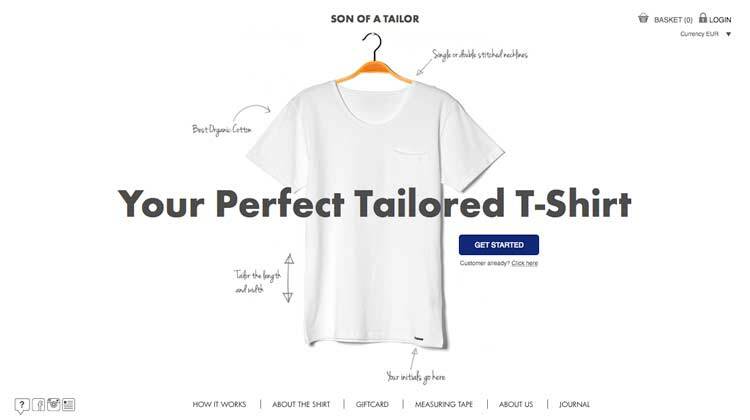 Ordering online the tailored t-shirt was an easy process. The image of the shirt provided me with an ability to zoom in on different areas of the shirt. I found this unnecessary, as I couldn’t see any details on the shirt due to the dark color. Even if I had chosen a white shirt, there isn’t much to see in zoom anyway. The next stage was when I realized this process was truly great. I was given the choice between 3 different measurement options. The first was by using the measurements of my favorite shirt, the second was by taking measurement of my own body and the final option was the traditional S, M, L scale. I loved having the choice and even having the ability to create a shirt that fits me exactly like my current favorite shirt, it was a no-brainer for me. I chose to take the measurements from my favorite shirt. This is where things got way more detailed, don’t confuse detailed with complicated. The design of the process made detailing the specific measurements of my shirt easy and I never felt overwhelmed or baffled. The combination of good web design and a thorough process created a very pleasant process. Once I had entered all of my measurements, I ordered the shirt and was told to expect my delivery in two weeks. Two weeks later on the dot, my shirt arrived in the mail. I will start by saying that I’ve never seen a shirt boxed before. You expect boxed packaging when receiving shoes or a watch, but not a shirt. As you can see, the packaging was professional with an edge that came from its individuality and this I liked. The box was sealed by a white sticker, which I thought was a little out of place. I almost felt like the box should have been sealed by a piece of string or even just by its own folding mechanisms. 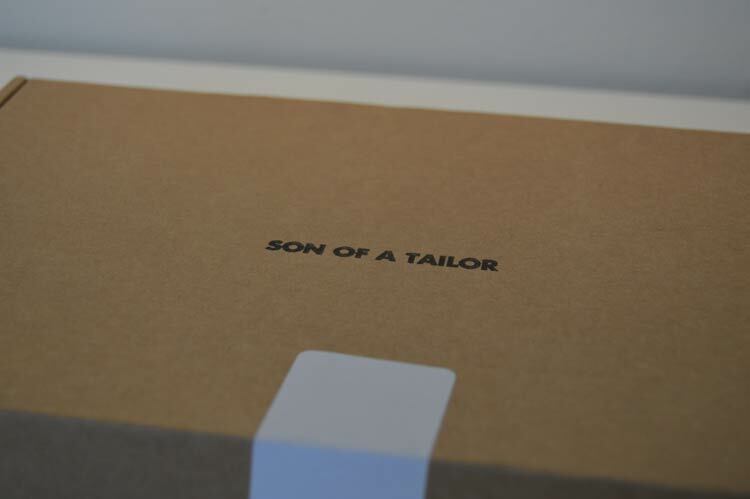 I proceeded to open the box and my shirt lay neatly with what appeared to be a Son of a Tailor envelope. I proceeded to open the envelope to discover a typed letter that thanked me for my purchase and assured my that my shirt had been individually tailored. It was a nice touch but I couldn’t help feeling that it would have suited the overall feel of the product if the letter were handwritten. That’s just the kind of feeling I got from the whole experience so far. By the first touch of the shirt, I realized that the fabric was of high quality. It almost felt smooth to the touch without being thin. There was substance to the material which I feel is needed in a shirt. As part of the tailoring process, the tailors take the time to put your initials discretely onto the lower corner of the shirt to add that extra sense of personalisation, again a nice touch. It was now time to put the shirt on. As soon as the shirt went on, I felt like something was wrong. Something didn’t fit. If this was supposed to fit me like my favorite shirt, well, it doesn’t! Rather than drive myself crazy with potentially irrational feelings, I went for a second opinion. I asked family and friends to give their honest opinions on how they felt the shirt fit me. Each and every one of them said the same thing: “It fits you perfectly”. After hearing this, I drew to the conclusion that perhaps my idea of a perfect fit was in fact an imperfect fit! As the day progressed, I came to realize that the shirt was really performing well in various situations that my other shirts don’t do well in. For example, riding up when bending over, lifting up when raising the hands etc. The shirt seemed to understand my body and my movements, which is everything I want in a shirt I feel comfortable in. Overall, I’d give this experience 9/10 Lewis Points! 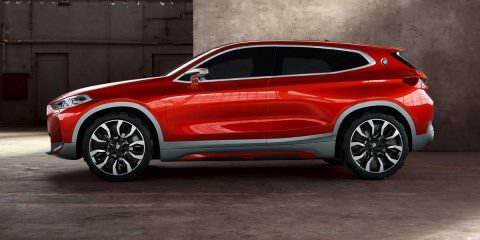 I felt that there were some little touches in the process that didn’t match the overall feel of the brand. I got a white sticker when I expected something more personal and I received a typed letter rather than a more bespoke handwritten one. However, I will say that the experience is one that I will recommend to anyone reading this review as the simplicity of the order, the quality of the garment and the performance of the shirt have changed the way I view my shirts. I will have no hesitation in ordering a shirt from sonofatailor.com again.